The par four 1st hole at Olde Stone set the tone for the rest of the round as it handicaps the most difficult hole on the course. Arthur Hills’ name doesn’t garner tremendous respect amongst golf architecture aficionados and the snobbish sort over on the Golf Club Atlas boards. Personally, I generally enjoy his designs; granted, his portfolio of Kentucky courses is fairly small (I’ve played 8 of his 10 Kentucky projects, plus Longaberger G.C. in Ohio) and think he and his design team get a bad rap. However, he and his then-associate J. 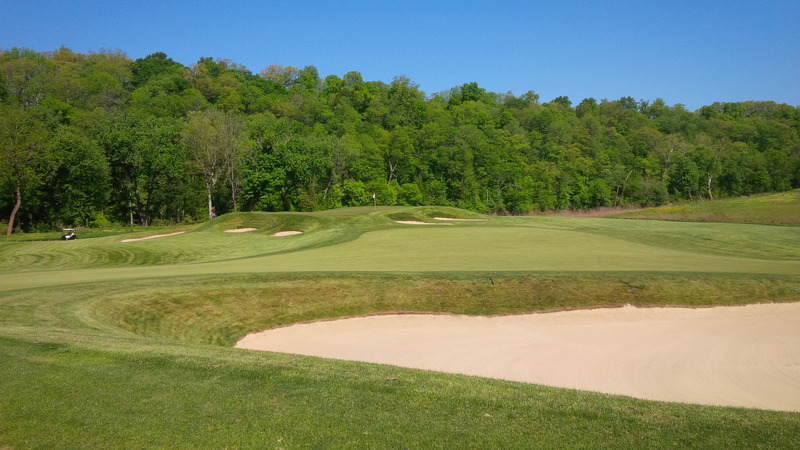 Drew Rogers (@JDRgolfdesign) created a gem, and perhaps even a masterpiece, when they built The Club at Olde Stone in Bowling Green, Kentucky. 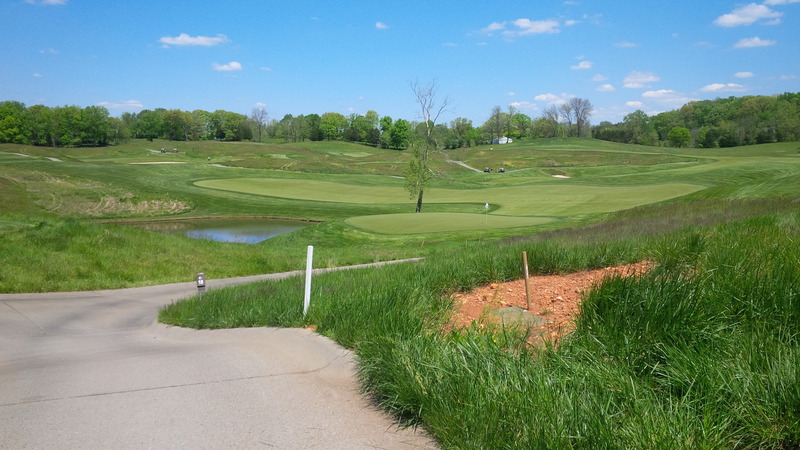 The Club at Old Stone is a private country club that I wouldn’t otherwise have access to, except that the Kentucky Golf Association opened their new 2015 KGA Amateur Series at the course. The multitude of bunkers guarding the 2nd fairway and green were typical of the many hazards protecting par (and bogey) at Olde Stone. 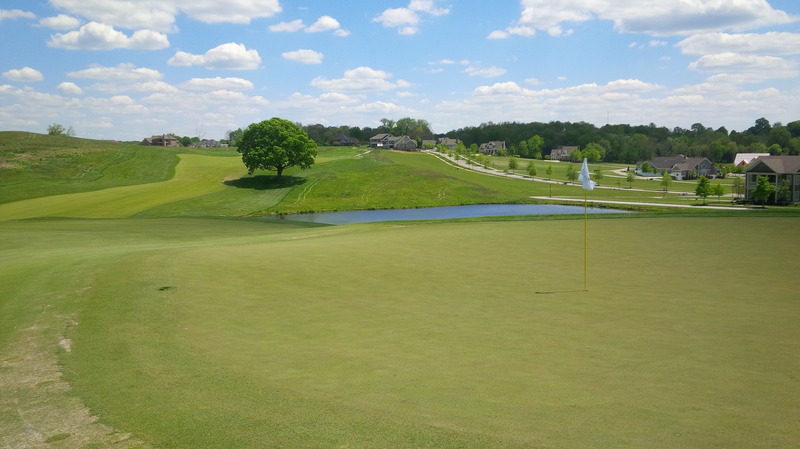 The 18-hole stroke play event at Olde Stone drew widespread interest amongst golfers across Kentucky, garnering 135 competitors, as Olde Stone is one of those courses in Kentucky that everyone has heard of and wants to play, at least once. 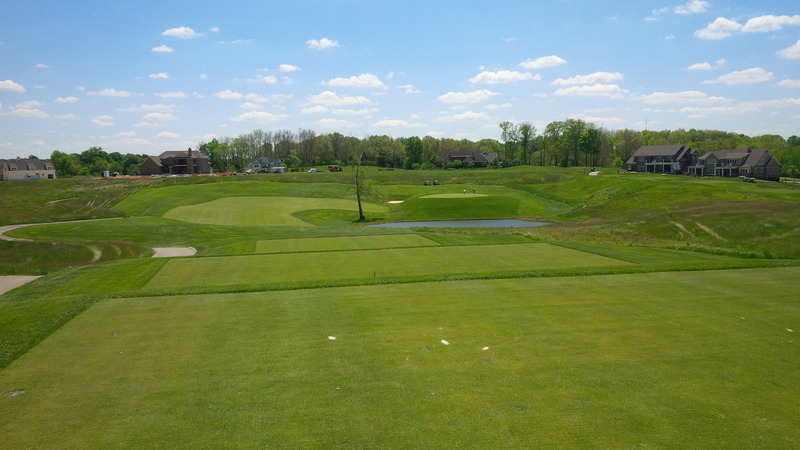 Commissioned by local paving and construction magnate Jim Scott, and opened in 2006, the golf course at The Club at Olde Stone is physically and stylistically impressive, kept in immaculate condition, and tremendously difficult to play well for the average mid or high handicap golfer. The first thing I noticed upon arrival was how big the golf course was, both in terms of length from tee to green and the sprawling nature of the course’s routing. The par three 3rd green complex was large, undulating, and quick as greased lightning. 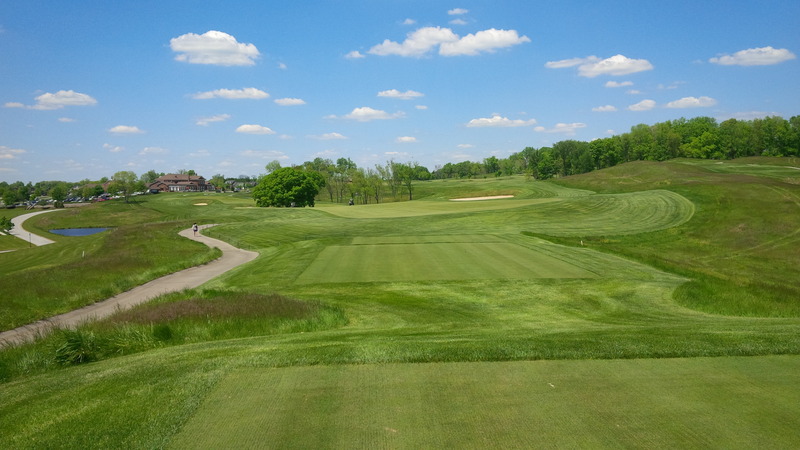 Our less-than-championship flight played from the blue tees, which are the middle set of five available tees and measure to 6,524 yards with a rating and slope of 71.8/134. The course can be stretched to 7,333 yards with a course rating and slope of 75.8/139 from the championship “gold” tees, which places the course on par with Persimmon Ridge, Valhalla, and Triple Crown as the most difficult tracks in Kentucky, and from which I cannot imagine golf would be any fun at all. The beautiful Zoysia fairways at Olde Stone were generously wide, yet aligned at angles that were deceptively uncomfortable from the tee. And the course punches you in the nose right out of the gate, with an incredibly difficult uphill par 4 to an elevated green. Despite most of the front nine being routed through the flat river bottoms of Drakes Creek, the fairways and approaches of holes #2 through #7 all have subtle but substantial tilts and contours that add an extra degree of aiming difficulty to the already tough task of avoiding the well-bunkered target areas and long grasses that lie just past the lush green rough. Don’t let the glistening dark green color seen from the 4th tee fool you; the fairways are kept tight and firm at Olde Stone. 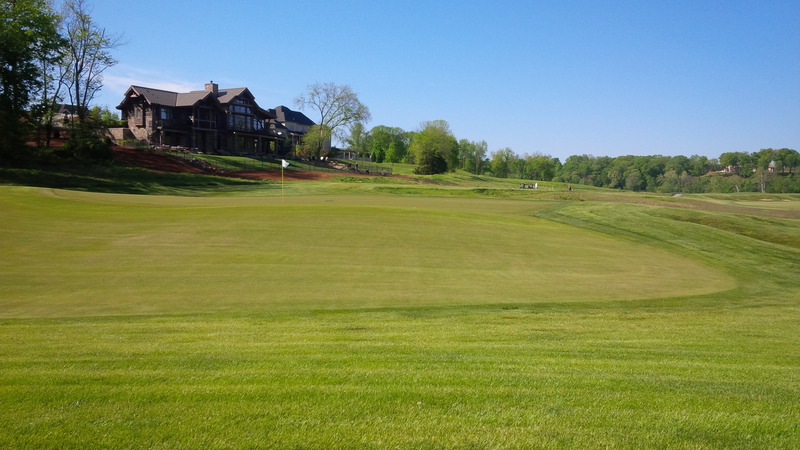 Simply aiming for the middle of the fairway isn’t really an option at Olde Stone. In that respect, Olde Stone almost has an element of Pete Dye’s make-you-think deviousness in its architecture. There just aren’t many, if any, grip-it-and-rip-it tee shots. 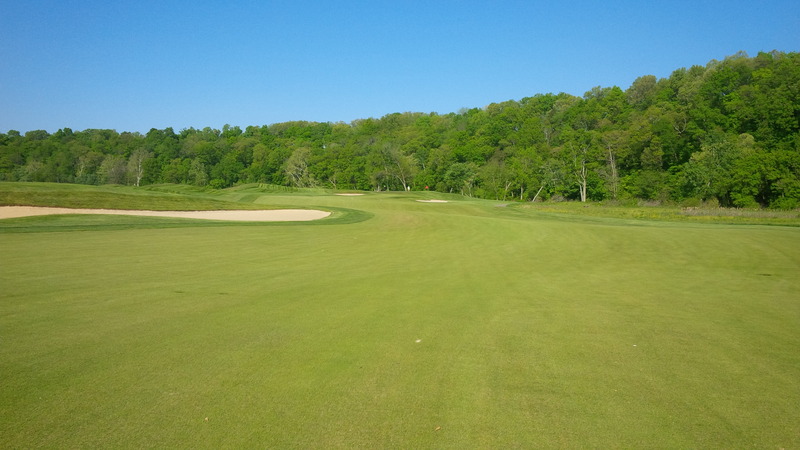 This particular stretch of holes on the front nine (#2-7) is a distinct course within the course at Olde Stone. The flat, treeless expanse of holes in the creek bottom is very much a links style collection of golf holes that affords a player the opportunity to use a ground game to attack the gigantic greens. Not something you’d necessarily expect to find in rural southern Kentucky. The natural areas abutting the mowed rough is where errant shots go to die, which is no comfort from the 6th fairway. Only a few holes into my round, I remember thinking that if Olde Stone’s Greens Committee decreed that the rough be decreased by one or two mowing passes, the course would be almost unplayable for the hapless high handicapper. Like most any high-end, manicured golf course, the rough at Olde Stone was just as thick and lush as the fairways. Just longer. And resistant to applying any significant or controllable spin on even a well-struck shot. Per standard Arthur Hills fare, Olde Stone’s greens are extra-large, full of multiple shelves, slopes, undulations, and ridges. As you might expect, every possible pin position is defended by some sort of par protector, be it a sand bunker, earthen bunker, false front, collection area, mogul, or elevation change. Not being able to see the entirety of the putting surface of the 8th green makes it an incredibly difficult short par 3. And then there are the greens’ surfaces. They are absolutely the unquestioned superstars of the course. Frankly, I’ve never putted on anything like them. I’ve played golf on courses with literally frozen greens, where any surface in the shade didn’t thaw despite well-above-freezing air temperatures (one Thanksgiving weekend in Atlanta at the Heritage Golf Club comes to mind). And I honestly don’t know if those frozen surfaces were as lightning fast or serpent slippery as the greens at Olde Stone. 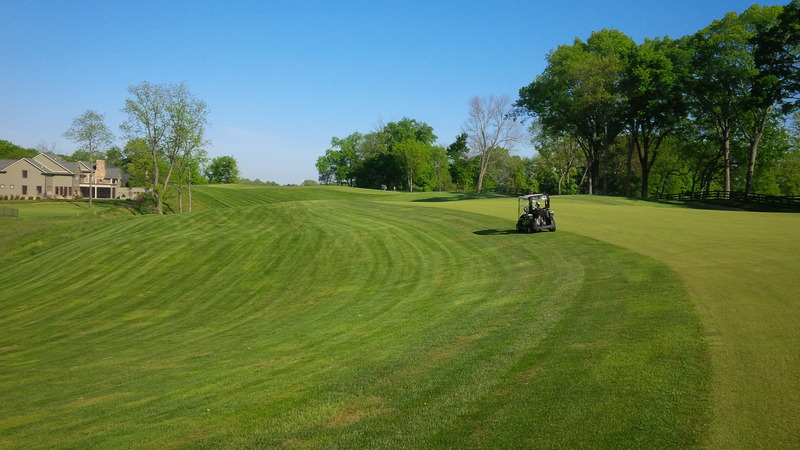 Even John Mark, my friend who is a member at Traditions Golf Club, where the greens are kept notoriously, almost unfairly, fast, admitted that he’d never putted or played on anything like Olde Stone’s greens. From both the tee and the green (looking back) of the par 4 10th, you get a sense of how much larger a role elevation change plays on the back 9 than on the front. After the first couple of holes, I accepted that the greens were going to be incredibly fast and that I was going to blow a few putts well past the hole, which was fine. In addition to the stroke play, there was a Skins side game that kept my interest up long after my cumulative score had become obscene. But the cumulative effect of each successive glass-like putting surface was real and demoralizing, especially with so many slopes on the greens. Super fast greens like that took away any inkling of putting a confident, much less aggressive, stroke on a putt, or chip for that matter. Still photography doesn’t do justice to the incredible slopes and ridges that create the near punchbowl green at the par 3 12th green. I’ll freely admit that I’m guilty of playing defensive golf more often than not, but I’m trying to change that tendency as I gain more confidence in my game. And perhaps the second time around Olde Stone’s track I would a little less fearful, knowing what was coming next. However, as jaw-droppingly fast as the greens were, there were in absolutely spectacular condition and rolled true on every shot. Simply put, putts went where they were aimed, which offset any sense of “unfairness” inherent in having such slick greens. There was no poa annua to disrupt a perfectly struck putt. There were no signs of disease creeping into bent grass to add to a golfer’s consternation. There were familiar elements of other courses or golf holes, but each of Olde Stone’s 18 holes are a delightfully unique challenge. I’ll never get to play in the Masters Tournament, so putting at Olde Stone might very well be as close as I get to the Augusta National greens experience. 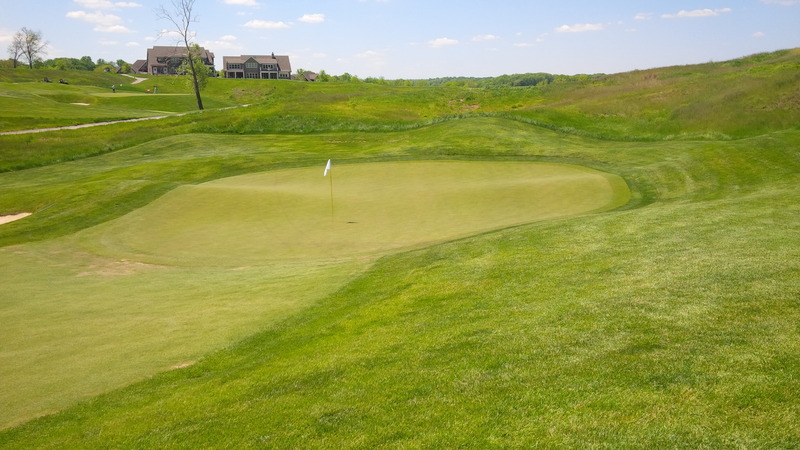 There are houses adjacent to the course on the back nine that, when coupled with the moderate to severe elevation changes tee to green, give the back nine at Olde Stone a distinctly different feel than the front nine. Most of the homes are relatively large and sit upon sufficiently large lots to prevent the housing from intruding into the golf experience, save for the disruption of the vistas. Every hole at Olde Stone presented a unique strategic challenge (beyond the difficulty navigating the aforementioned greens), so I’m not sure that any one hole qualifies as the course’s signature hole. Nonetheless, while almost all the holes are memorable, there are a few in particular that will stick out in my mind in perpetuity. The par 4 14th hole is a boomerang shaped dogleg right that creates the possibility of driving the green…if you can carry the lake that lies between the two. God hates a coward, so why not just go for the 14th green in one? From the blue tees, as the crow flies, it is only roughly 260 yards from the elevated tee box to the equally elevated green, creating the ultimate risk-reward opportunity. I’ve played several holes with driveable greens in recent years, but I don’t recall one with such a vast expanse between the reward of pulling off the shot and the risk of going for it and missing it. For those keeping score at home, my attempt cleared the lake but was pushed right, trickling halfway down to the lake below. I begrudgingly accepted my penalty-free double bogey. The medium-short par three 16th hole is a great shortish golf hole. From an elevated tee, the approach areas all feed hard left toward the long, slender green, with little navigable room left of the green before dropping 20-ought feet into Drakes Creek below. It’s a fantastic hole to me because even at 160 yards, there are multiple ways one can try to (and even successfully) attack the green and the pin. Amongst our group, I hit a low, running, less-than-full six iron than ran with the approach’s slope to trickle onto the green for a great look at birdie. Another of our group hit a high, beautiful fade into and against the slope of the green, getting the ball to stop quickly for a good look at birdie. The third group member hit a hard, driving short iron right at the pin that ended landed against an up-slope, taking enough speed off the shot for the ball to come to rest on the back of the green. From the highly elevated 18th tee, you can see the finish line in the distance, which, sadly, means the Olde Stone experience will soon come to an end. Just as memorable is the closing par 5 18th hole. Standing on the windswept tee box, facing a big, right to left downhill shot around a tree and lake, the hole had an 18th-at-Kapalua feel to it. That sensation quickly fades as you assess the second shot up the hill to a well guarded green. Walking up to the green, I felt a sense of accomplishment, much like I imagine I would feel if I ever ran and finished a marathon near the back of the pack. I was disappointed, but not embarrassed, by the 98 I posted. I’d kept in under 100 in my first non-club tournament ever on an incredibly difficult golf course. 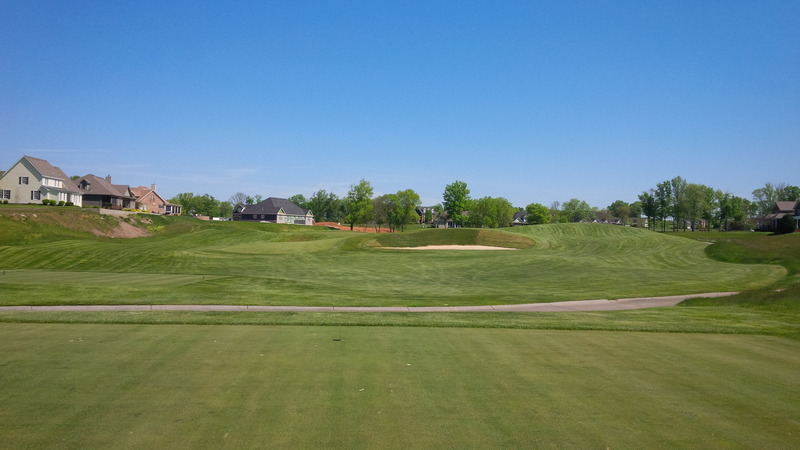 Despite the severity of the challenge, The Club at Olde Stone was a surprisingly fun golf course to play. A lake that can’t be seen from the tee is a cruel trap for the unsuspecting long hitter at the closing hole. I enjoyed the challenge presented by the golf architecture. The scenery was peaceful and relaxing. And the conditioning of the course was absolutely stunning. I don’t know if any of the major golf publications bother sending actual reporters or evaluators to Kentucky, or if they just accept word-of-mouth stories and accumulated reputation as gospel for the relatively low-traffic locales like Bowling Green, Kentucky. Either way, expect to find the Club at Olde Stone ascending the ranks of the region’s, if not the nation’s, best golf courses. And if you ever have the opportunity to play it, don’t pass on it. Just remember to bring your “A” game. ← Results of the (much delayed) March Poll Question: the longest iron in your bag? Dave, great review. Sounds like an awesome play the second time through and after you re-enter your comfort zone! Amazing course. Just walked it w Belmont college golfers in recent tournament. 7 miles as spectator. Descent btn 7 & 8 was monster. Cart worth the $40.